I want to share my thoughts with you regarding this weekend. We made the decision quite naturally to celebrate the anniversary of the new dawn of history, the resurrection of Christ, with the Church. Nothing unusual about that, but we decided to make it with the larger church. We went to three different Easter services at three different church brands. That is 3x more than we have ever done before. Two on Saturday and one today. Some might say this is something you do when you are ‘looking for a new church’. For me that is not the case. I am already a member of “The Church”. My heart is flooding with ideas over all of this. In the past I would have felt out of place in doing this and would have seen anyone who did it as a disconnected Christian. After a long time of wrestling over the issue, I am liberated. I have had the clear idea for a while, since the last pastors conference we did in 2008, that the Church needs to really become one. Walking that out on a practical level, when so much of the church culture today is built on something else, is not so easy. Tough, because there are barriers first in my own mind. We spent most of our adult lives in a church where superiority comparisons were commonplace. It played to my insecurities and I played along. Also, I have really believed and still do in the awesome role of the local church in relationship to accountability, discipleship and mutual endeavor. However, I dismissed the imbalances I have seen in this area due to the upside. Secondly, the barriers in the church culture are formidable. When we visited church number 2 last night, where we used to attend regularly, one of the good people there said to me, “Welcome home”. In the past I would have reacted sheepishly (pun intended) to this, or more recently gotten irked over the prodigal implication, but instead I just laughed. I know the Church itself, the biblical Kingdom of God where trust and purpose coexist in the community of believers, is where I feel at ‘home’. The pull of fife-dom belonging is immense. We innately want to belong to a group we like, but the truth is that the overemphasis of the local church over the Church is a deep, religious, unbiblical imbalance that I believe is keeping people away and the Holy Spirit grieved. I talk about being free here in this conviction, but I suppose I should get back to you after I get some feedback. I have kept it mostly to myself so far, so it is yet to be tested. We must test all things. All I know is that I am operating by conscience and have a John 17:22 vision for the larger Body that Christ is building. God won’t let me shake it, and I can’t help feeling this wilderness time we are in is connected with a need to learn to stand strong, even if alone. As in all cultures, there is a lot of mammon and flesh arrayed to maintain the status quo. I wish I could say that the church today is free from this, but we all know otherwise. For the record, each service was amazing. People were saved, baptized, added to the Kingdom and Christ was duly exalted. It was exhilarating. A friend hammered me to state which service I liked best, for which I had no answer. As a citizen of Heaven first, how could I? I am free. Now, I also had a bit of a spark in me to put together a message from this lesson I am living through, called, “The sermon you wont hear your pastor preach”. Is that too provocative? Or is it pointless, since you wont hear him preach it? I cherish your thoughts on this. This is one of those occasional posts to remind you that we have not gone away altogether. 2009 has been a tough year for our supporting business efforts that allows us the awesome privilege of going to India in the first place. We do have an alternate expression zone that you may not know about. It is our CelleCast which you can hear on your phone or web browser any time. Just go to: http://cellecast.com/christgate/ to get the direct dial number. You can also leave a talkback there as well. A prayer, a thought, a hope. Speaking of hope, our friends over at Living Hope Church just concluded an awesome crusade in India last week. We are hearing great reports from them on the aftermath. I am thinking that since there is not likely to be much more news from here about a new trip to India til next year, that I might blog about other issues here from time to time. After all, Christ is the Gate to all wisdom, hope and knowledge, so our theme can certainly use some widening as well. Hi guys please check this cool video of 2008 India Trip. We will keep you updated with our upcoming events this year..
Hello my brothers and sisters in Christ its good to write you all once again. Just a little update of what we were able to do as CGI Ministries this month. As a ministry one of the principles we always follow is working with local churches. We form a network get acquainted with the local pastors and have a strong relationship with them. We pray for them and their church and support them in what ever way we can and extend the Kingdom of God together. It has been raining heavily here in India as it is our monsoon season and lots of homes and lives were affected and came to standstill by the rain. Pastor Caleb, his church and myself have been working with a people group who call themselves as Rag Pickers. They make their living by picking rags, plastic’s, metal from the garbage and selling them to the waste paper mart guys. They live on the small huts made of plastic sheets by the road sides neglected by the community as well as the government. Due to the rain the homes were washed off and some roofs were leaking and were not able to go out for work. We as a ministry were able to provide 5 kilo’s of rice and 1 kilo of dhal for about thirty families with the guidance of pastor Caleb. We were able to talk to them and pray for them ,they are such loving people who are thirsty for the word of God and real Love. Just minutes after we gave the rice one of the huts were a blind couple live caught on fire and burnt a portion of the hut. Rest of the community helped to contain the fire and extinguish it before it spread to the rest of the huts. We bought a new plastic sheet to cover the burnt area and fixed it for them. This is just one small part of the great need here in kanchipuram district. Please pray for the affected and for pastor Caleb and his ministry. If you want to support financially please click on the following link. Donation Forms. Then the King will say to those on the right, ‘Come you who are blessed by my Father: take your inheritance, the Kingdom prepared for you since the creation of the world’. Take time to look at these pictures. 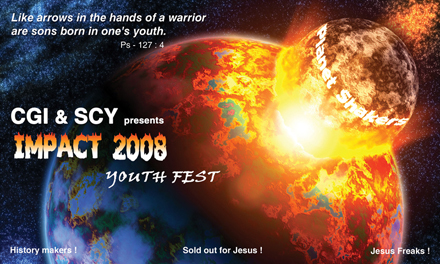 Greetings my dear friends, i want to start by thanking God for his Mercy, Grace, favor and provision for this meeting and want to thank you all for praying for IMPACT - 2008 it was awesome. WE CREATED HISTORY. It was one powerful day. We had a record turn out of 1100 young people, from about 60 churches. The whole auditorium was filled with shouts of praise, dancing and celebration. We had an awesome time of worship, the Spirit if God moved in a mighty way, young people were speaking in tongue’s and seeing visions many were experienced speaking in tongue’s for the first time and many were healed and delivered during the time of worship. The bible says His word will not return void, so did it happen on that day. God used and spoke through Pastor Martin very practically of coming out of slavery and being useful for God from the book of Philemon. The word of God came in Power and Might penetrating every soul and heart and about 140 of them rededicated their lives to Christ Jesus, many were set free from addictions and sinful obsessions. That’s the reward for all our prayers and efforts - Hearts and lives being changed and God’s Name being Glorified. We had a great feast and it was time for some fun…. We had five competitions eating, singing, preaching,dancing and quiz. All the churches came prepared for them. There was an uproar of noise as guys and girls started to support and cheer for the churches. It was hard for the judges to pick the best as all of them were doing great. Many hidden talents were surfacing and all of them stayed till the end and received their prizes and gifts. The First overall championship trophy went to Praise Garden Church (Pallikarani) and the Second went to TELC Christ King Church (Kalpakkam). I receive phone calls from pastors and youth leaders of how their young people’s lives have changed intensely and how they being such a blessing to the church and community. Many pastor called and said the competitions opened their eyes to see that they have such talented and gifted youths in their church. Overall through the meeting Jesus Christ Rocked the district of kanchipuram and set hearts on fire for Him. None of them went empty that day they left as Impactor’s, Warriors and Planet shakers ready to spread the revival fire to their church, community and district. I believe young people are the future for the nation of India what more if these young people are all Jesus Orientated ready to make an IMPACT where ever they go like their Master Jesus Christ. I once again thank God and thank everyone who prayed and supported in every way for this meeting. May God Bless You and May His Countenance Shine Upon You. This Vigil For Civility website promotes the simple idea that by standing together in prayer, we all win. Our peace is reinforced (we all need help reducing incidences of election freakout syndrome that seems to be sweeping the country). Our voice is heard. Our insistence on civility in politics is sent as a petition to both God and man. Friends of CGI… we can really use your support with this. Just go to the website and fill out a simple form declaring your particular passion and personal Act of Vigilance (AOV). This is an instant community created to respond to a very urgent need in this election. It is totally non-partisan… for a reason. People need something to cool down partisan hackery, and this is something where we should all agree, even as we, through other means are means are supporting one candidate. No conflict here. All Glory and Honor to our Lord and Saviour Jesus Christ alone. Church unity is not a message I ever thought I would associate myself with. I had always felt, and seen demonstrated that to be in unity and/or submission with/to the church or organization in which you are raised is all that God requires. For my part, I have valued that loyalty, continue to value it, and have seen its honorable rewards. The biblical local church is indeed where life happens: Discipleship, Partnership, Worship and Love. So, with my focus on this, I used to categorize most messages about unity with the larger church as largely idealistic rants born not of spiritual inspiration, but mostly as the good intentions of men, resulting instead to an unnatural uniformity if not an outright dilution of Godly convictions. Can you relate? After preaching about this however, and continuing to discover more on the subject from the Word, prayer, and feedback with pastors at our conference, I am more convinced than ever that we are missing something of God’s design for the church in the current paradigm. Before you either accept or reject what I am saying, agree with me first that we, for better or worse, are fully immersed in the status quo. The idea that the church be reformed after the New Testament design set out by Christ and Paul is 2-3 steps foreign to our ‘market-me-first’ driven culture. Even those who get it and long for it have yet to see a breakthrough. It is not an easy picture to convey, and the nature of man and the world works against any constant recasting a prophetic call for our cooperation in God’s vision. That’s right. GOD’s vision for THE church. Take a look at some key scriptures: John 17:22(Christ’s big prayer request) and the entire jist of Ephesians. When you read this, you have to come away realizing that God’s vision is quite different from ours. It is we that stray toward individual kingdom building. We concern ourselves with individual and small group victories, which are of course important, but how often do we concern ourselves with the victory that God is seeking in the Earth? Evangelism, prayer, para-church organization building all have their place, but none of these can substitute for fulfilling God’s clearly stated goal of building the ‘one-body’ biblical church. Joshua and I discussed the recent reports we posted on the terrible violence against the church in India. The upside of this tragic injury to the church has been that the church is gathering as never before. Good, right? Well, not entirely. Some of the gatherings shifted from being about prayer, and about being the church, to some rising up and calling for the formation of a christian political party. Some even have called for retaliation against Hindu’s in these gatherings. Despite the understandable pain of loss and a reasonable passion for justice to prevail, isn’t the strategy of darkness obvious here? Gather, gather, gather indeed. But do it to honor God and rejoice that you are considered worthy to suffer for His name. This is how God calls us to shine as a remarkable witness to His glory as the overcoming church. So, in closing, what is this ‘else’ I refer to in the headline? No, it is not a threat to bring harm to any of my readers. What the else is is a condition. It is the condition we find ourselves in in this generation along with many prior generations. It is a chronic disunity that we have learned to call normal, glossing over the scriptures that call us to account. By the Spirit of God, I am calling the Church to a deep repentance to return to obedience to the heavenly vision. Church leaders, please join in. 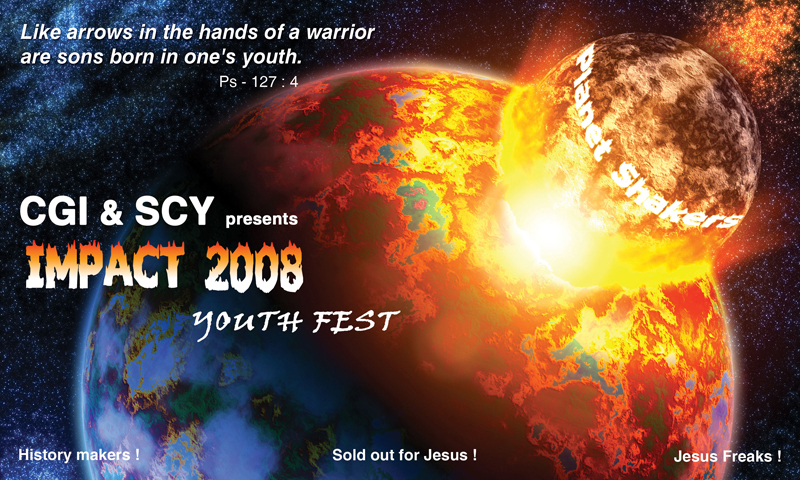 Impact 2008 is our theme for our 1st annual youth revival fest. It is going to be held at chengulpet (the centre of kanchipuram district) on the 25th of October. We had a amazing planning meeting at the Tamil Lutheran Church (chengulpet) were all the senior pastors from various taluks and denomination took part and gave their full support for this meeting. South Chennai Youth Pastors Fellowship also joined in for the meeting and has offered their full support. We are expecting about 1000 to 1300 young people from throughout the district, and we have also identified an ideal place that can hold that many. Our heart desire is to empower young people through radical Spirit filled worship and soul stirring word of God. My prayer and dream is that when they leave that day they should never be the same as they came but go in Power, Love and Sound mind and make an IMPACT where ever they are and in what ever they do, bring CHANGE and Glorify Christ Jesus. I believe young people are the future for the Nation and its time that they stop impressing and start making impact. Please pray for an awesome outpour of the Holy Spirit and for all the necessary arrangement that needs to be done. Pray that God would change, heal and light his Fire in every young man and young women’s heart. Greetings once again to all in the Name of our Lord and Savior Jesus Christ. Just wanted to update you guys on whats happening in India, i hope you guys are aware of it, if not please read Pastor Caleb’s post. Churches are standing together conducting mass processions, rallies and fasting prayers and are raising support in every way to help those who are being brutally tortured for their faith. Please take time to look into these links and the power point presentation to understand in detail and pray more effectively for the affected.